This year Cineffable is opening up to live music by receiving for this real first concert, the jazz band Hatshepsut. Wednesday, October 30 - 7.30 P.M.
Hatshepsut is an all-female jazz band performing original compositions and improvised music. This variable-sized group performs in France and internationally. 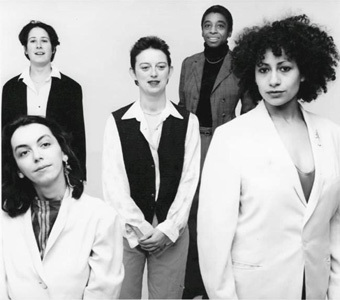 With (from left to right on the picture), Hélène Halévy (piano), Nathalie Braux (bass clarinet), Nicole Coppin (double bass and electric-bass), Aldridge Hansberry (drums) et Michèle Véronique (violin).